The Lover’s Lock Amulet is a Portuguese good luck piece worn by fishermen and their wives to preserve their deep love for one another. During the extended periods of separation, this remarkable amulet keeps their spirits united. 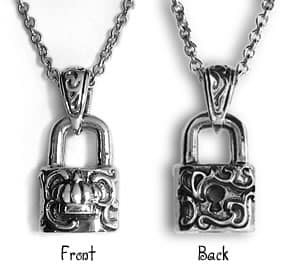 And during times of stress or turmoil, the Lover’s Lock symbolizes the eternal bond. It reminds the couple that temporary difficulties will soon subside. If your partnership is precarious and it needs to be reinforced, the Lover’s Lock could be of immense help to you. It may remind both parties how important your commitment is to one another.